Nigeria’s richest pastor and self-styled bishop, David Oyedepo, has made a glistening addition to his business empire by floating an airline called Dominion Air. Oyedepo, who a few years ago ignited debate on flamboyant Christianity by acquiring his fourth private jet, is the owner of Dominion Publishing House, Covenant University and an elite secondary school called Faith Academy. Listed by Forbes as Nigeria’s wealthiest pastor with a net worth of $150 million, David Oyedepo is a preacher and founder of Living Faith Church Worldwide, more popularly known as Winners’ Chapel. Besides his four private jets, Forbes also mentioned the preacher’s luxury homes in London and the United States. Sources within the Corporate Affairs Commission (CAC), the agency charged with business registration in Nigeria, confirmed the registration of Dominion Air with David Oyedepo as its chairman. 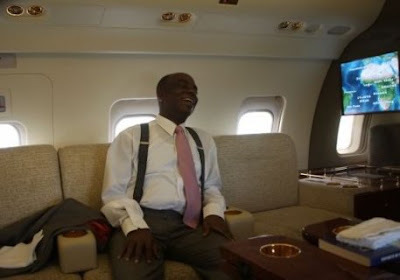 Another source within a Lagos-based insurance firm known to handle most of Oyedepo’s businesses said the airline project had been in the works for six years and was only made a reality this year. The broker who balked at putting figures to the number of aircrafts so far purchased authoritatively said none of them is on lease. If Oyedepo’s entry into the airline business is creating exciting buzz in Nigeria’s stock exchange, the same cannot be said with the Christian community, especially the Pentecostal congregations, where the so-called men of God have been criticised for alienating their poor followers with their flamboyant lifestyle. According to Lawrence Ofili, a member of the Save Nigeria Group (SNG), the social movement that staged days of protest over this year’s controversial fuel price hike, Nigerian pastors are increasingly acting like politicians who put themselves first before the people. “Pastor Oyedepo by his choice of businesses has severally demonstrated a disconnect between himself and hundreds of thousands of poor Christians who he claimed to have come to deliver. About 90 per cent of public schools in this country were built by early Christian missionaries; today Oyedepo has Covenant University but it is for children of millionaires,” says Mr Ofili.